Taking inspiration for its design from nature, Monad Terrace comprises bay-front condominium residences nestled around a glittering lagoon. 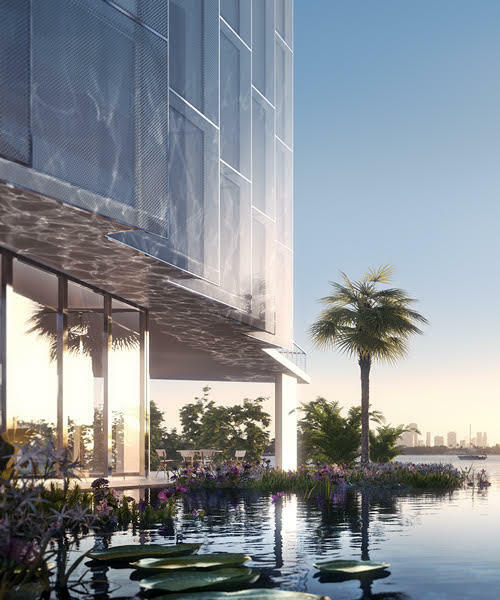 The residences, crafted by Pritzker Prize winner Jean Nouvel, capture natural light via floor-through views of the bay and beyond. 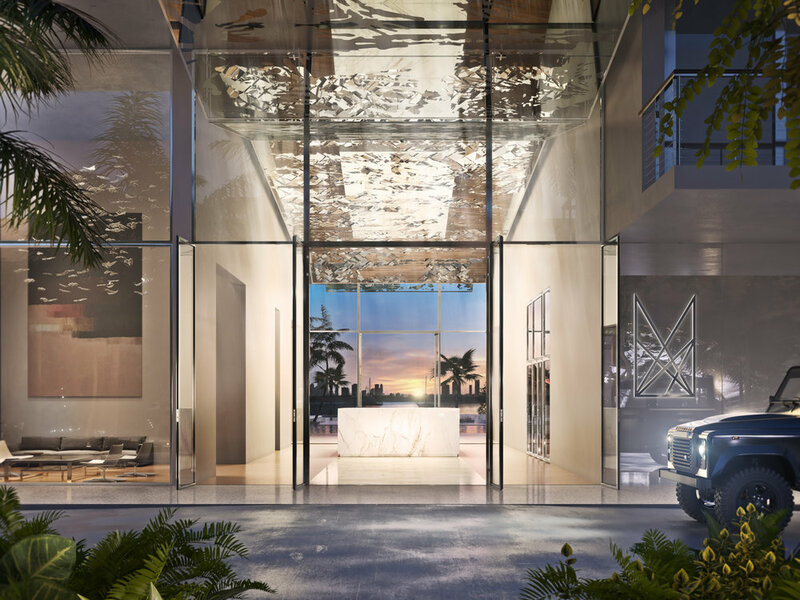 From the naturally filtered lagoon and native landscaping that flow through the property to connect West Avenue and Biscayne Bay, to the curtain of hanging gardens and bespoke details that bring privacy and character to each home, Monad Terrace evokes beauty and luminosity that speaks to the highest and most luxurious taste of real estate in Miami’s South Beach Bay. 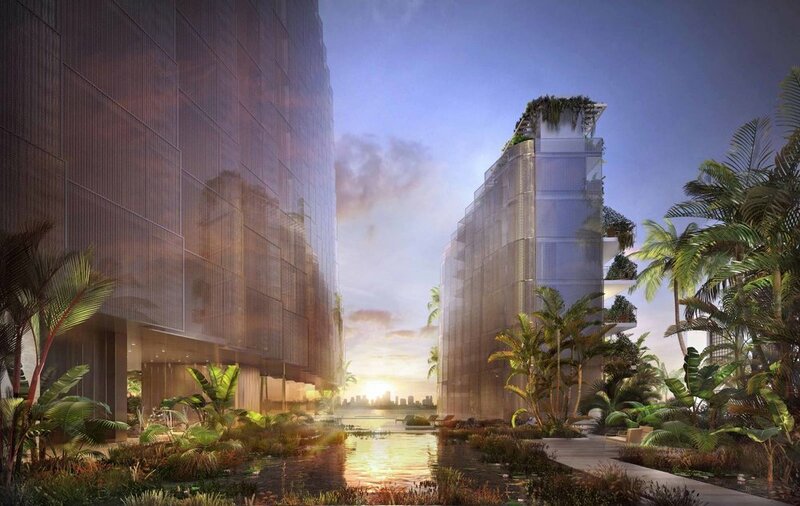 This 59-unit U-shaped two tower building with 8 floors on one end and up to 14 floors on the other end of the tower, features a striking lagoon on the ground floor and will allow residents to lounge on pods throughout it. An adjoining bay-front pool features a waterfall, which provides the illusion of a water slide into Biscayne Bay. One side of this eco-conscious building will have an external green wall with living vegetation. These vertical gardens will provide privacy and energy-saving shade, while improving air quality and reducing the urban heat island effect. 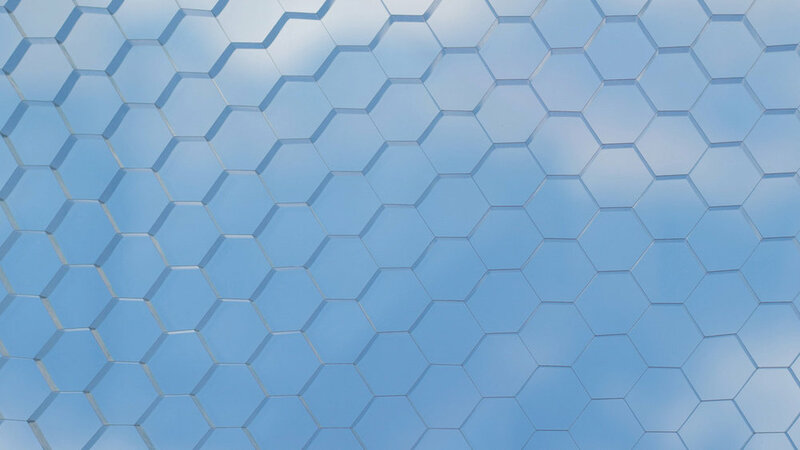 A major feature of the design is a series of honeycomb-patterned angled gauze-like panels on the exterior, which will help to diffuse the bright sunlight entering the apartments. The ‘honeycomb’ screen system built into the building’s glass façade not only ensures unobstructed views, privacy, and natural light, but also significantly reduces glare and solar heat gain — in turn saving energy and reducing the building’s carbon footprint. Monad Terrace is situated in a prime waterfront location - one of the last developable "on the water" lots in Miami Beach, Florida. Residences range from two to five bedrooms with generous indoor and outdoor living spaces. 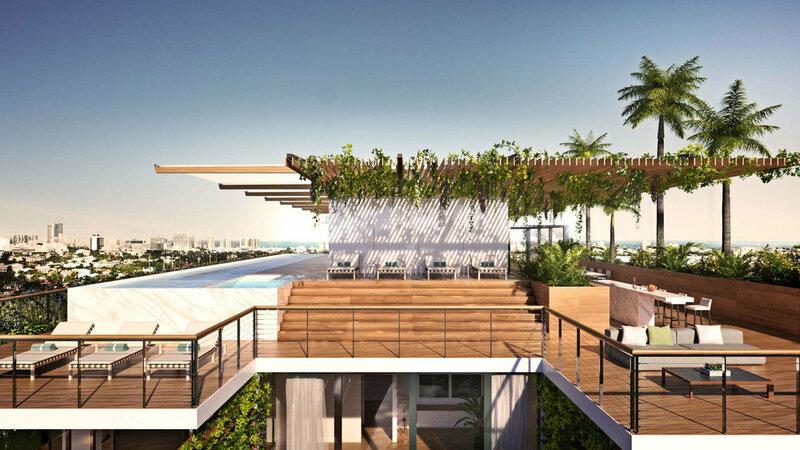 The building’s amenities include an in-house concierge, a sun deck with a 116-foot swimming pool and hot tub overlooking Biscayne bay, valet parking, a café and juice bar, residents’ lounge, a wellness center, and a bicycle and water sports storage room. Four penthouse residences include private pools on roof decks. Jean Nouvel artfully directs the play of reflections and water throughout the two towers, bouncing light into living spaces. 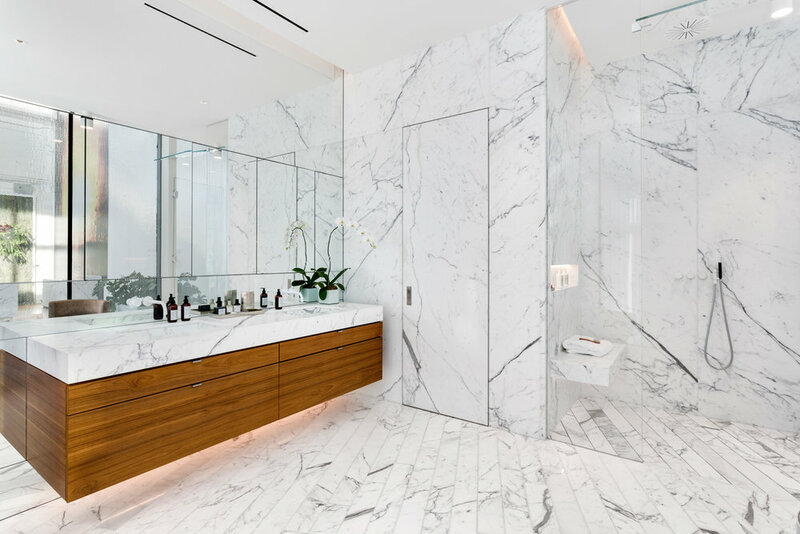 Everything is designed to enjoy the myriad views and textures of light, where at least 90% of the residences have gorgeous water and downtown Miami views. Residents will have the ability to view the sunrise from one deck of their private terrace and finish off the day gazing into the sunset from the other end. South Beach has matured into one of Miami’s most prestigious and sought-after neighborhoods. The bay side of South Beach provides a relaxed and tranquil setting that other neighborhoods envy—a thoughtful pedestrian-friendly community offering an eminently civilized, healthy way of life. An eclectic mix of shops, restaurants, wellness boutiques, and recreational activities are within minutes of Monad Terrace.